My mother makes these scones every Christmas. They are famous in our family, especially when she also makes her maple walnut butter to slather on top. 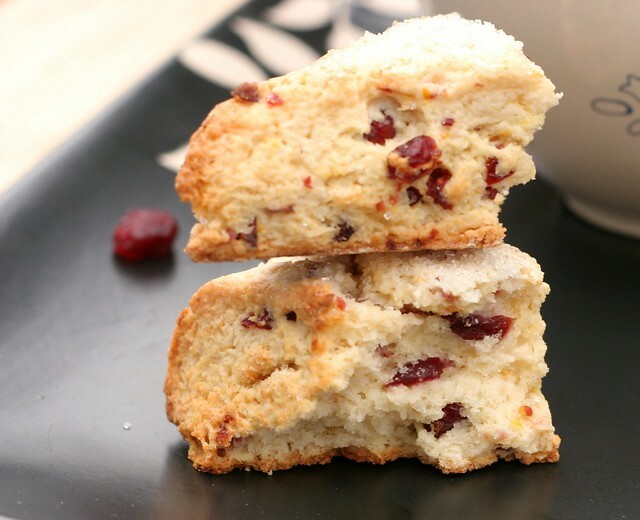 They are dense from the cream cheese, taste so fresh from the orange zest, and are bursting with cranberries. They are festive and delicious. Of course I love them because I'm a tea person. What's better than tea and scones? Start by mixing the dry ingredients in one bowl, then cut up a stick of cold butter. You don't want room temperature butter for this, the cold butter helps make a flaky dough. Mix it in with the dry ingredients with a mixer, a fork or your hands. You want the butter to be about the size of peas, then you can add the cream cheese. 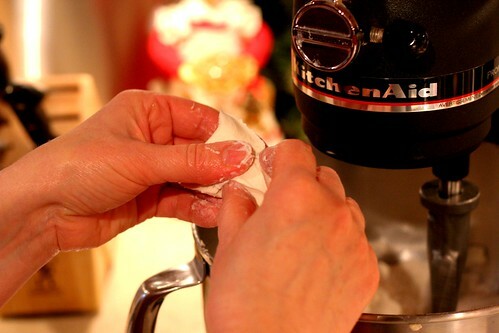 Pull the block of cream cheese apart and drop it in the mixer. Can you imagine what cream cheese scones taste like? HEAVEN. In a separate container, whisk together the egg, vanilla and milk. Add this combined mixture to the flour mixture and gently mix to form dough. This is a fantastic base for scones. It's creamy and wonderful. At this point, you can add any flavors you like! Fresh blueberries would be a beautiful thing. Add lemon zest to the dough, then whip up a lemon glaze to pour on top of the scones by mixing lemon juice and powdered sugar. 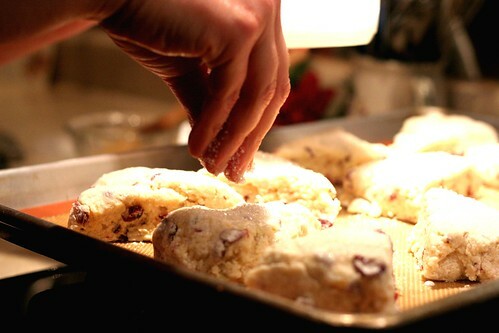 But today we are making cranberry orange scones because it's Christmastime. 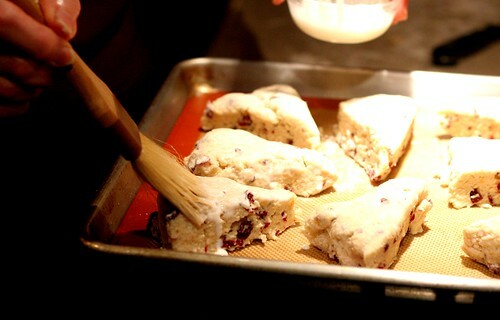 I do like whole cranberries in scones, but for these it's best to chop up some dried cranberries. The smaller size adds a more subtle flavor. Zest a small orange. Resist the urge to mix it in to your shampoo because you were suddenly inspired to have your hair smell like fresh oranges. 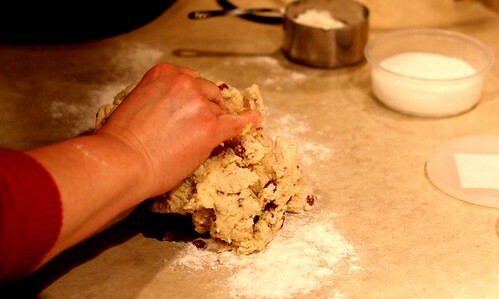 Dump the dough onto a floured surface and knead it a few times, turning it over in the flour until it holds together. Form it into a long rectangle. It should be about an inch thick. 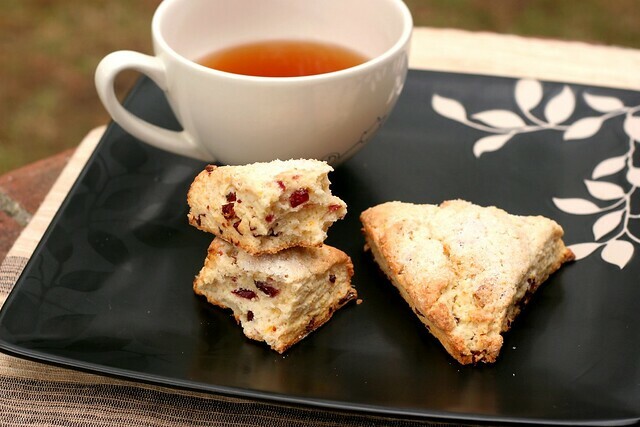 Start at one end of the rectangle, and cut a diagonal to form a triangle shaped scone. Move the whole way down, shifting your knife like this. Carefully place them on a baking sheet and brush with half and half. Sprinkle the top of the scones with sugar. Then lick your fingers. You should probably wash your hands at this point. Then put those babies in the oven. And here is what they look like... so lovely. 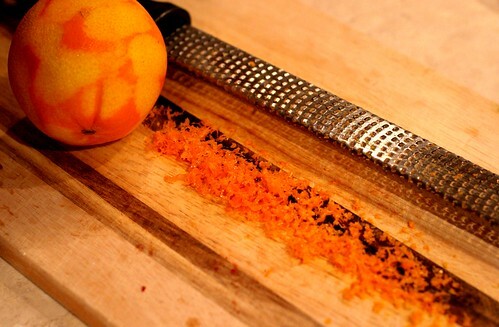 See the orange zest? They make wonderful gifts too! Just put a few scones in a decorative bag tied with a bright red ribbon. Who wouldn't want that for Christmas? Preheat oven to 425 degrees. 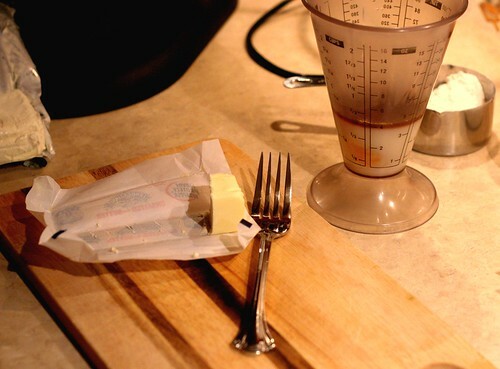 Have on hand a baking sheet with parchment or a silpat. In a medium-sized bowl, whisk together the flour, sugar, baking powder and salt. Cut in the cream cheese and butter using a pastry blender, fork, mixer or your fingers, until the chunks of butter are the size of peas. 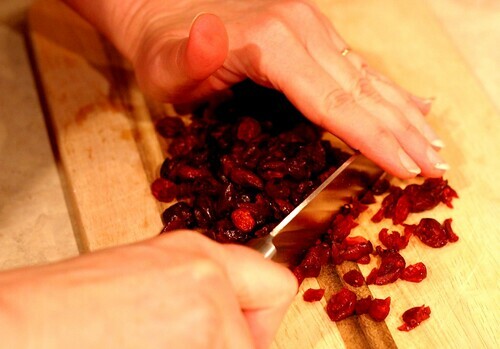 Chop up dried cranberries, then add them to the dry ingredients with the orange zest. Mix until just combined. In a separate container, whisk together the egg, vanilla and milk. Add wet ingredients to the dry. Gently stir until dough is evenly moistened. 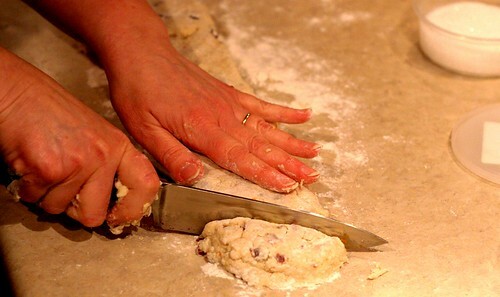 Turn the dough out onto a floured surface, fold it over several times in the flour until it holds together. Pat the dough into a long rectangle, about an inch thick. 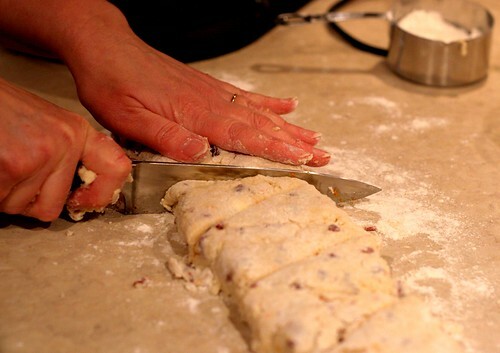 Cut the scones into triangles, by alternating your knife and working down the rectangle. Place them on a baking sheet, then brush with half and half and sprinkle with sugar. Bake at 425 degrees for 8 minutes. Turn your oven OFF, and bake for 8 more minutes. 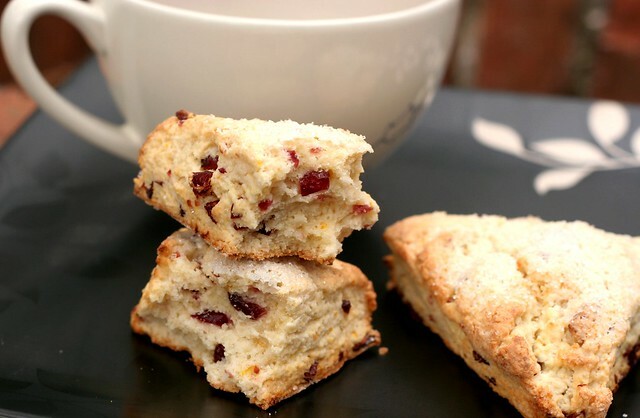 Your mother makes these scones often for me:) They're my favorites. Looking at your pictures makes me want to jump right through the computer and grab one. YUM ! !